Please choose one Greenergystar solar panel: 1.5W, 6W, 12W, 40W, 100W, 110W. 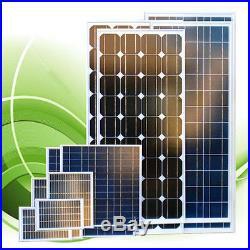 1.5W Polycrystalline Solar Panels. Open Circuit Voltage (Voc). Maximum Power Voltage (Vmp). Short Circuit Current (Isc). Maximum Power Currrent (Imp). ±5% (1.43W – 1.58W). 40’C to 80’C. 115 x 85 x 3mm. 6W Polycrystalline Solar Panels. ±5% (5.7W – 6.3W). 28.3 x 18.3 x 2.5cm 11.1 x 7.25 x 1 inches. 0.834kg, 1.83lbs. 12W Polycrystalline Solar Panels. ±5% (11.4W – 12.6W). 33.7 x 28.3 x 2.5cm 13.3 x 11.1 x 1 inches. 33.9 x 27.3 x 2.5cm 13.25 x 10.75 x 1 inches. 1.27kg, 2.67lbs. 40W Polycrystalline Solar Panels. ±5% (38W – 42W). 50 x 50 x 2.5 cm. 3.25kg, 7.17lbs. 100W Polycrystalline Solar Panels. ±3% (97W – 103W). Installed to box (about 0.8m). 1181 x 541 x 35mm 46.5 x 21.30 x 1.38 inches. 7.84kg, 17.28lbs. 110W Monocrystalline Solar Panels. ±5% (104.5W – 115.5W). Install to box (90cm). 120.5 x 55 x 3.5cm 47.4 x 21.7 x 1.4 inches. 8.4kg, 18.5lbs. Additional information about solar panels. Solar panel generates free energy for many general household appliance. These solar panels also specially designed for use in sailing boats, green houses, cars, radios, recreational vehicles, portable televisions, warning lights, flash lights, garden lights, house light, garage lights and ventilators for rooms and cars. They can also be installed into a grid-tie system. 6 – 8% (Low) efficiency. Panel size is huge because of low efficiency. Small Panel Size (1/2 of Amorphous). Heavy weighted (Hard to install). Light Weighted (Easy to install). Rectangular shaped cells (utilize all of the available surface area). Silicon solar cells – Enclosed with epoxy and high-quality resin material – Rain proof, rust proof and corrosive proof, protects against wind, rain, salt air and solar radiation. Improper installation, accident, misuse. Any unauthorized disassembly, repair, or modification. NO OPERATING COST GENERATES ELECTRICITY FROM THE ABUNDANT RESOURCE – SUNLIGHT. All pictures and descriptions are subjected to change without notice. We are not responsible for any inadvertent errors. E on 100W and 110W panels. For Address that UPS determined to be outside of their normal service area, they will charge an additional “extended area surcharge”. Items that are used/ damaged/ deformed or altered in any ways will not be accepted. Spams and mass e-mailing will be deleted without slightest glance. E-mails with virus or anything subjected to hacking are automatically deleted. The item “Pick One 12 V Solar Panel 1.5W, 6 W, 12 W, 40 W, 100 W, 110 W Fit GRID TIE INVERTER” is in sale since Thursday, February 16, 2012. This item is in the category “Home & Garden\Home Improvement\Electrical & Solar\Alternative & Solar Energy\Solar Panels”. The seller is “hi_iq” and is located in Vancouver, British Columbia. This item can be shipped to United States, to Canada. Please choose one Greenergystar grid tie inverter: 300W, 400W, 400W MPPT, 600W MPPT MPPT to Enhance Power Output by 30%! 400W MPPT Grid Tie inverter Feature. ALL Models has LED cycling motion Second Generation Normal Operation. AC Disconnected / Fault. Unique and intuitive display design – LED cycling in circular formation – Represent electric meter spinning backward and power is being output to the grid – Smooth motion. Grid-Tied – sell green power directly back to the grid at a premium rate (depends on your location) – NEW Maximum Power Point Tracking (MPPT) algorthim to optimize power output – Plug and Play Design, simply plug into an outlet (GFI), no hard-wiring – 60% enhanced in power output compare to first generation inverters – 38% better in. And 51% better in. With higher quality parts – Unique and intuitive LED display design to reflect power output rate – External 30A Fuse for easy maintenance – Automatic 110V – 220V AC voltage switch, NO MORE manual hassle – Wider DC Input Voltage Range, from 10.8V 28V compare to 1st generation’s 14V 28V – Allow MORE types of power source to be connected ie: Air-X, 12V battery, and etc. Aluminum enclosure will act as heat sink to help dissipate heat – Stackable (connect in parallel for higher output) – Island protection: Inverter will shut down during black outs. Simple and safe installation – Reverse polarity protection – Generates pure Sine Wave – Constant Power Output – Low distortion output on all ranges – Allow different Power factor from loads – Does not require rewiring of existing electronics – Compact and light weight design Electrical Specifications – Output. Maximum AC Output Power. 100 260V Auto Switching. Total Harmonic Distortion (THD). Yes, inverter shuts down during black out. Electrical Specifications – Input. DC Input Voltage (Solar & Wind). 10.8V – 28V. Unlimited as long as it doesn’t exceed main circuit amperage limit. 20’C – 65’C. 1.27kg 2.65lb. Dimension (L x W x H). 16.3 x 15.4 x 5.7 cm 6.3″ x 6.10″ x 2.25. Wall Mount at base. Convection cooled with fan. 1 Red and 6 Green LED. What are included: – One GreenergyStar GP2A-400 Hybrid Grid-Tied Inverter – One spare 30A fuse – One 1.5m North America Standard AC Cable – Instruction Manual. 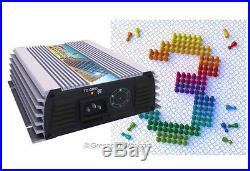 600W MPPT Grid Tie inverter Feature. Maximum Power Point Tracking (MPPT) – optimize power output. 50% enhanced in power output compare to second generation inverters. Unique and intuitive LED display design to reflect power output rate. Allow MORE types of power source to be connected with SolarWind Hybrid RX Charge Controller ie: Air-X, 12V battery, and etc. Grid-tied – sell green energy back to the utility at a premium rate. Plug and Play design, simple and easy. No hard-wiring or rewiring of existing electronics. Automatic 110V – 220V AC voltage switch. Island Protection: Inverter will shut down during black outs. Synchronize with grid and generates pure Sine Wave. Stackable (connect in parallel for higher output). Maximum input power: 600W (rated at 16.6V and 36A). System Voltage: 12V Nominal (see input / output sections for range). 2x External 30A fuse for easy maintenance. Internal diode to prevent reverse current to solar panels or wind turbine at night. High quality finned aluminum casing to protect internal electronics and act as heat sink to dissipate heat. Microprocessor based control electronics to regulate input and output. 1X Grid Power 3 grid-tie inverter. 1X 1.5m North America Standard AC Cable. Connects directly to Nominal 12V Solar Panels. Nominal 12V AC or DC wind turbine installations with battery will require respective charge controllers and dump loads. Recommend using the GreenergyStar SolarWind Hybrid RX charge controller to monitor charging and discharging. Connect the included cable to the inverter, and then connect the other end to a wall socket. Reverse polarity in input will blow fuse and possibly. Damages caused by reverse polarity is. 100V 260V Auto Switching. Yes, Inverter will disconnect from grid during black out. 48V (anything above will damage inverter). Above 60A will blow fuse. Under 60A will heat up internal electronics. Disconnect immediately do avoid damage. 1.17kg 2.6lb. 19.3 x 16.5 x 5.4 cm 7.5″ x 6.5″ x 2.1. High quality finned aluminum to act as heat sink for fast heat dissipation. 6 Green, 1 Orange and 1 Red LED. 400W Grid Tie inverter Feature: – Plug and Play Design, simply plug into an outlet (GFI), no hard-wiring – 60% enhanced in power output compare to first generation inverters – 38% better in. What are included: – One GreenergyStar GP2-400 Hybrid Grid-Tied Inverter – One spare 30A fuse – One 1.5m North America Standard AC Cable – Instruction Manual. 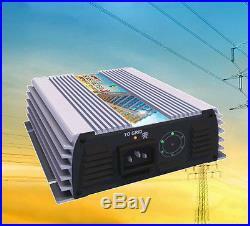 300W Grid Tie inverter Feature: (Model: SSI-300) Grid Tie Inverter Video Demo. What is Micro Grid-Tie Inverter? First, we should know what a Grid-Tie Inverter is. A Grid-Tie Inverter is a device that that can transform DC electricity (ie: Solar Panels, Wind Turbine, Battery Storage) into AC power that can be directly injected into your utility’s electricity network (the power grid). As of today, most inverters available in the market are in the high output (1000W 5000W) category. Their prices ranges in the thousand’s range and it is just too much of an up front cost for anyone interested in green energy generation. In addition, because of the high output, a certified electrician will need to be hired to install the equipments and connect the cables. Ever since we invented the first generation of the Micro Grid Tie Inverters, connecting to the grid has never been this easy and affordable. This is the perfect start up solution for anyone interested in green energy generation as it is affordable and maintenance free. In addition, our inverters are stackable ; meaning multiple unit of these devices can be connected in parallel to generate a higher output. It is up to us. Up to this generation. To lead mankind into a greener future. Electrical Specifications – Output. Nominal AC Output Power. AC output voltage range. Total harmonic Distortion (THD). DC input voltage range. 10.8V – 26V. 1.16kg 2.56lb. Grid-Tied – sell green power directly back to the grid at a premium rate (depends on your location) – Maximum Power Point Tracking (MPPT) – optimize power output – Plug and Play Design, simply plug into an outlet (GFI), no hard-wiring – Stackable (connect in parallel for higher output) – Island protection: Inverter will shut down during black outs. Simple and safe installation – Reverse polarity protection – Generates pure Sine Wave – Constant Power Output – Low distortion output on all ranges – Allow different Power factor from loads – Does not require rewiring of existing electronics – LED indicators to reflect power output rate – Compact and light weight design – RoHS Compliant. One Enviro-techs SSI300 Grid-Tied Inverter – One 1.5m North America Standard AC Cable – Instruction Manual. Additional information about grid tie inverters: What is Micro Grid-Tie Inverter? Non- Reusable Power being consumed today. Reusable Power being generated for a better tomorrow and a brighter future. What is Maximum Power Point Tracking (MPPT)? MPPT is a techinque we implemented to get the maximum possible power from a solar panel. When trying to characterize the output of a solar panel mathematically, it can be represented by an IV-Curve (shown below). The equation for Power is P = IV. Where I is the Current , V is the Voltage , and P is the possible output Power. Each point on the curve is a possible combination for output power and our goal is to find the best combination to obtain maximum power. In simple terms, we are trying to get the biggest rectangle to fit under this so called IV-Curve, the bigger rectangle we can fit, the more power we get. Below are graphs to help you understand the idea better. This is a comparison between inverters with and without MPPT on an 85W solar panel. Please note that different solar panels will have slightly different IV-Curves. No Tracking Vs Tracking. Figure 1 No MPPT, with voltage fixed 17.5V P = 17.5V x 4.6A = 80.5W. Figure 2 With MPPT, amount of current and voltage to draw are calculated P = 17V x 4.95A = 84.15W. As we can see, Figure 2 is able to 84.15W with MPPT while in Figure 1, we can only get 80.5W. This is 4.5% increase in power output. Why do we care? Because solar panels are still quite expensive these days, and the increased power output will directly affect our return on investment (ROI). In addition, depending on weather, time of the day and amount of solar irradiation the panel receives, the IV curve will move along the Y-axis to reflect the possible increase / decrease in potential power output, and cause the maximum power point to shift along as well. Coming up are illustrations to visualize this idea. IV-Curves Under different weather conditions. Sunny, Clear Sky days in Summer 600 1000 W/m2. Scattered Clouds or Partly Cloudy days in Summer 300 600 W/m2. Cloudy or fog days, dawn or dusk in Summer 100 300 W/m2. Figure 3 – 5 illustrate the power gain in different weather condition with MPPT compare to a non-tracking inverter that locks voltage at 17.5V. While 17.5V is randomly chosen, it does show what would happen in real life when there is not MPPT. Studies have shown, by making use of MPPT, there will be an average of 30% increase in power production. Since the maximum power point is a variable, we have implemented a tracking algorithm that utilizes the micro processing power of our inverter to calculate the optimum voltage and current to maximize our energy harvest. Figure 1: AC Power. Figure 2: DC Input. Install in a low humidity and well-ventilated area. Remove all flammable objects. Connect the Solar Panel, Battery or Wind Turbine’s DC supply cables to the DC input terminal of the inverter as shown in Figure 2. Wind Turbine installations will require respective charge controllers and dump loads. Connect the inverter to a wall socket with the supplied AC Power Cord as shown in Figure 1. Pay close attention to the polarity of your DC input. Connecting incorrectly might blow the fuse. In such case the inverter will make a buzz sound whenever power is connected and the fuse will need to be replaced. Improper installation, accident, misuse. Any unauthorized disassembly, repair, or modification. NO OPERATING COST GENERATES ELECTRICITY FROM THE ABUNDANT RESOURCE – SOLAR & WIND. All pictures and descriptions are subjected to change without notice. We are not responsible for any inadvertent errors. Items that are used/ damaged/ deformed or altered in any ways will not be accepted. Spams and mass e-mailing will be deleted without slightest glance. E-mails with virus or anything subjected to hacking are automatically deleted. The item “Pick One, 10.5 V-28 V DC MPPT GRID TIE INVERTER 60 HZ 110 V-120 V190 V-240 V AC” is in sale since Monday, January 16, 2012. This item is in the category “Home & Garden\Home Improvement\Electrical & Solar\Alternative & Solar Energy\Chargers & Inverters”. The seller is “hi_iq” and is located in Blaine, Washington. This item can be shipped worldwide. Please choose one Greenergystar grid tie inverter: 300W, 400W, 400W MPPT, 600W MPPT. ALL Models has LED cycling motion Second Generation Normal Operation. AC Disconnected / Fault. Unique and intuitive display design – LED cycling in circular formation – Represent electric meter spinning backward and power is being output to the grid – Smooth motion. 300W Grid Tie inverter Feature: (Model: SSI-300) Grid Tie Inverter Video Demo. What is Micro Grid-Tie Inverter? First, we should know what a Grid-Tie Inverter is. A Grid-Tie Inverter is a device that that can transform DC electricity (ie: Solar Panels, Wind Turbine, Battery Storage) into AC power that can be directly injected into your utility’s electricity network (the power grid). As of today, most inverters available in the market are in the high output (1000W 5000W) category. Their prices ranges in the thousand’s range and it is just too much of an up front cost for anyone interested in green energy generation. In addition, because of the high output, a certified electrician will need to be hired to install the equipments and connect the cables. Ever since we invented the first generation of the Micro Grid Tie Inverters, connecting to the grid has never been this easy and affordable. This is the perfect start up solution for anyone interested in green energy generation as it is affordable and maintenance free. In addition, our inverters are stackable ; meaning multiple unit of these devices can be connected in parallel to generate a higher output. It is up to us. Up to this generation. To lead mankind into a greener future. Electrical Specifications – Output. Nominal AC Output Power. Maximum AC Output Power. AC output voltage range. Total harmonic Distortion (THD). Yes, inverter shuts down during black out. Electrical Specifications – Input. DC input voltage range. 10.8V – 26V. 20’C – 65’C. 1.16kg 2.56lb. Dimension (L x W x H). 16.3 x 15.4 x 5.7 cm 6.3″ x 6.10″ x 2.25. Convection cooled with fan. 1 Red and 6 Green LED. Grid-Tied – sell green power directly back to the grid at a premium rate (depends on your location) – Maximum Power Point Tracking (MPPT) – optimize power output – Plug and Play Design, simply plug into an outlet (GFI), no hard-wiring – Stackable (connect in parallel for higher output) – Island protection: Inverter will shut down during black outs. Simple and safe installation – Reverse polarity protection – Generates pure Sine Wave – Constant Power Output – Low distortion output on all ranges – Allow different Power factor from loads – Does not require rewiring of existing electronics – LED indicators to reflect power output rate – Compact and light weight design – RoHS Compliant. One Enviro-techs SSI300 Grid-Tied Inverter – One 1.5m North America Standard AC Cable – Instruction Manual. 400W MPPT Grid Tie inverter Feature: (Model No: GP2A-400) MPPT to Enhance Power Output by 30%! Grid-Tied – sell green power directly back to the grid at a premium rate (depends on your location) – NEW Maximum Power Point Tracking (MPPT) algorthim to optimize power output – Plug and Play Design, simply plug into an outlet (GFI), no hard-wiring – 60% enhanced in power output compare to first generation inverters – 38% better in. And 51% better in. With higher quality parts – Unique and intuitive LED display design to reflect power output rate – External 30A Fuse for easy maintenance – Automatic 110V – 220V AC voltage switch, NO MORE manual hassle – Wider DC Input Voltage Range, from 10.8V 28V compare to 1st generation’s 14V 28V – Allow MORE types of power source to be connected ie: Air-X, 12V battery, and etc. Aluminum enclosure will act as heat sink to help dissipate heat – Stackable (connect in parallel for higher output) – Island protection: Inverter will shut down during black outs. Simple and safe installation – Reverse polarity protection – Generates pure Sine Wave – Constant Power Output – Low distortion output on all ranges – Allow different Power factor from loads – Does not require rewiring of existing electronics – Compact and light weight design Electrical Specifications – Output. 100 260V Auto Switching. Total Harmonic Distortion (THD). DC Input Voltage (Solar & Wind). 10.8V – 28V. Unlimited as long as it doesn’t exceed main circuit amperage limit. 1.27kg 2.65lb. Wall Mount at base. What are included: – One GreenergyStar GP2A-400 Hybrid Grid-Tied Inverter – One spare 30A fuse – One 1.5m North America Standard AC Cable – Instruction Manual. 600W MPPT Grid Tie inverter Feature: (Model No: GP3) MPPT to Enhance Power Output by 30%! Maximum Power Point Tracking (MPPT) – optimize power output. 50% enhanced in power output compare to second generation inverters. Unique and intuitive LED display design to reflect power output rate. Allow MORE types of power source to be connected with SolarWind Hybrid RX Charge Controller ie: Air-X, 12V battery, and etc. Grid-tied – sell green energy back to the utility at a premium rate. Plug and Play design, simple and easy. No hard-wiring or rewiring of existing electronics. Automatic 110V – 220V AC voltage switch. Island Protection: Inverter will shut down during black outs. Synchronize with grid and generates pure Sine Wave. Stackable (connect in parallel for higher output). Maximum input power: 600W (rated at 16.6V and 36A). System Voltage: 12V Nominal (see input / output sections for range). 2x External 30A fuse for easy maintenance. Internal diode to prevent reverse current to solar panels or wind turbine at night. High quality finned aluminum casing to protect internal electronics and act as heat sink to dissipate heat. Microprocessor based control electronics to regulate input and output. 1X Grid Power 3 grid-tie inverter. 1X 1.5m North America Standard AC Cable. Connects directly to Nominal 12V Solar Panels. Nominal 12V AC or DC wind turbine installations with battery will require respective charge controllers and dump loads. Recommend using the GreenergyStar SolarWind Hybrid RX charge controller to monitor charging and discharging. Connect the included cable to the inverter, and then connect the other end to a wall socket. Reverse polarity in input will blow fuse and possibly. Damages caused by reverse polarity is. 100V 260V Auto Switching. Yes, Inverter will disconnect from grid during black out. 48V (anything above will damage inverter). Above 60A will blow fuse. Under 60A will heat up internal electronics. Disconnect immediately do avoid damage. 1.17kg 2.6lb. 19.3 x 16.5 x 5.4 cm 7.5″ x 6.5″ x 2.1. High quality finned aluminum to act as heat sink for fast heat dissipation. 6 Green, 1 Orange and 1 Red LED. 400W Grid Tie inverter Feature: (Model No: GP2-400) – Plug and Play Design, simply plug into an outlet (GFI), no hard-wiring – 60% enhanced in power output compare to first generation inverters – 38% better in. What are included: – One GreenergyStar GP2-400 Hybrid Grid-Tied Inverter – One spare 30A fuse – One 1.5m North America Standard AC Cable – Instruction Manual. Additional information about grid tie inverters. Non- Reusable Power being consumed today. Reusable Power being generated for a better tomorrow and a brighter future. What is Maximum Power Point Tracking (MPPT)? MPPT is a techinque we implemented to get the maximum possible power from a solar panel. When trying to characterize the output of a solar panel mathematically, it can be represented by an IV-Curve (shown below). The equation for Power is P = IV. Where I is the Current , V is the Voltage , and P is the possible output Power. Each point on the curve is a possible combination for output power and our goal is to find the best combination to obtain maximum power. In simple terms, we are trying to get the biggest rectangle to fit under this so called IV-Curve, the bigger rectangle we can fit, the more power we get. Below are graphs to help you understand the idea better. This is a comparison between inverters with and without MPPT on an 85W solar panel. Please note that different solar panels will have slightly different IV-Curves. No Tracking Vs Tracking. Figure 1 No MPPT, with voltage fixed 17.5V P = 17.5V x 4.6A = 80.5W. Figure 2 With MPPT, amount of current and voltage to draw are calculated P = 17V x 4.95A = 84.15W. As we can see, Figure 2 is able to 84.15W with MPPT while in Figure 1, we can only get 80.5W. This is 4.5% increase in power output. Why do we care? Because solar panels are still quite expensive these days, and the increased power output will directly affect our return on investment (ROI). In addition, depending on weather, time of the day and amount of solar irradiation the panel receives, the IV curve will move along the Y-axis to reflect the possible increase / decrease in potential power output, and cause the maximum power point to shift along as well. Coming up are illustrations to visualize this idea. IV-Curves Under different weather conditions. Sunny, Clear Sky days in Summer 600 1000 W/m2. Scattered Clouds or Partly Cloudy days in Summer 300 600 W/m2. Cloudy or fog days, dawn or dusk in Summer 100 300 W/m2. Figure 3 – 5 illustrate the power gain in different weather condition with MPPT compare to a non-tracking inverter that locks voltage at 17.5V. While 17.5V is randomly chosen, it does show what would happen in real life when there is not MPPT. Studies have shown, by making use of MPPT, there will be an average of 30% increase in power production. Since the maximum power point is a variable, we have implemented a tracking algorithm that utilizes the micro processing power of our inverter to calculate the optimum voltage and current to maximize our energy harvest. Figure 1: AC Power. Figure 2: DC Input. Install in a low humidity and well-ventilated area. Remove all flammable objects. Connect the Solar Panel, Battery or Wind Turbine’s DC supply cables to the DC input terminal of the inverter as shown in Figure 2. Wind Turbine installations will require respective charge controllers and dump loads. Connect the inverter to a wall socket with the supplied AC Power Cord as shown in Figure 1. Pay close attention to the polarity of your DC input. Connecting incorrectly might blow the fuse. In such case the inverter will make a buzz sound whenever power is connected and the fuse will need to be replaced. Improper installation, accident, misuse. Any unauthorized disassembly, repair, or modification. NO OPERATING COST GENERATES ELECTRICITY FROM THE ABUNDANT RESOURCE – SOLAR & WIND. All pictures and descriptions are subjected to change without notice. We are not responsible for any inadvertent errors. Items that are used/ damaged/ deformed or altered in any ways will not be accepted. Spams and mass e-mailing will be deleted without slightest glance. E-mails with virus or anything subjected to hacking are automatically deleted. The item “Pick One, 50/60 HZ 110 V-120 V-190 V-240 V AC MPPT GRID TIE INVERTER 10.5-28 V DC” is in sale since Wednesday, January 30, 2013. This item is in the category “Home & Garden\Home Improvement\Electrical & Solar\Alternative & Solar Energy\Chargers & Inverters”. The seller is “hi_iq” and is located in Blaine, Washington. This item can be shipped worldwide.